Not all families are perfect. Some seem to be or pretend to be but others are brave enough to accept the fact that their family isn't exactly ideal. I believe that there will always be a bad apple or better yet some bad apples in a basket filled with apples. That's quite normal. However, no matter how rotten things are with your family, you still can't say that you hate them and that you don't want to them to be a part of your lives anymore. No matter what you do or no matter what you say, at the end of the day, they are still your family and there is nothing you can do to cut your ties with them. All you have to do is accept them for what they are no matter what. I've seen families fall apart because of different reasons. Some fight over inheritance, while others fight over money and other wordly possessions. Others decide to abandon their family members due to personal misunderstandings or even when their opinions clash or when they have a conflict of interest. Whatever the reasons may be, I still do not agree with what some people do. I don't want to be a hypocrite and say that I don't hate my family sometimes because of different things but I don't hate them to the point that I want them to be out of my life because I know technically, that's just not possible. Teenagers often have conflict with their parents and any other elder member of the family mainly because not all generations can see each other eye to eye thus, the inevitable happens. The older generation think that since they are older, they are more knowledgeable and therefore have more right to be listened to and to control or to mold the lives of those younger than them in the family while the younger generation are free spirited and rebelious. Often only thinking about themselves and what benefits them more, young people often make the mistake of trying to challenge the authority that the older generation have on them. Which in the end only provokes them and makes the situation far more worse. Honestly, I've been through the same situation myself while I was growing up and I believe it's normal. There will always be a power struggle between who will reign supreme and most of the time, the one who wins, only wins because the other one surrenders or simply gives way to his/her opponents. Either way, nobody gains anything. Sure, it may look like you've won and that you should celebrate but don't you think that is rather insensitive? I've had difficulties and challenges in the past and most of the time when I do get past all them, I am proud of myself but when I end up having a misunderstanding with any of my family members, I simply don't like it. First of all, I don't want to be a part of any power struggles that occur in my family. Politics has never interested me even in the slightest bit. Secondly, I am not the type of person who wants everything for myself without even thinking of the consequences. I know that no matter how good your intentions are in something, there will always be tons of consequences, good or bad. Lastly, I choose to avoid conflict and do not want to be pitted against anyone that I know and love. I just don't see me or anybody else gaining anything from such an experience. I simply have no idea why some people keep on insisting on fighting and arguing each other when you're family and you have to do what families are supposed to do best which is to love and care for one another, not take each other out and pull each other down. It's just not right. We have to realize that no matter how bad things get, we are all still lucky for even having families. Some people are without them and would do everything and anything just to be a part of one. I don't want to sound bitter or anything but at some point in my life, I also wanted my family to disappear because they keep on getting in my way but after a few years more of being with them, I realized that it doesn't matter how many times we're had misunderstandings or hurt each other, what matters is blood is still thicker than water which is why I totally appreciate having a family now. Sure, not everybody will realize this now but hopefully somehow in the future, they will. If you're family has done things to gravely scar you for life then I guess that's the only time you should get away from them and erase them from your life but to be at peace, you have to understand that you need to find forgiveness and understanding in your heart and what better way to do that by starting to let things go, little by little, somehow. Only when you've learned these lessons will you ever be free and happy. I therefore conclude that no matter how basic or how simple the word family means, it's not how it is in reality. Families are complicated and having one and being in one is just hard work. We may never truly understand the real meaning of family or how it should go but at least, we get to learn that not all families are the same. If you want your family to be better than what you've seen in other families then you must bring forth the change that you want to see in it in the future. Hopefully, after your efforts of molding and directing your family to the right path, you'll be able to smile to yourself and say, what a good job you've done. Until then, you have to have more patience and understanding with the family that you have now first. Only then will you learn that families are made to last and stay and there's nothing else you can do about them. Love them or hate them, they will still a part of who and what you are. You definitely owe a lot from them so learn to be more thankful. A family should stick together no matter what. 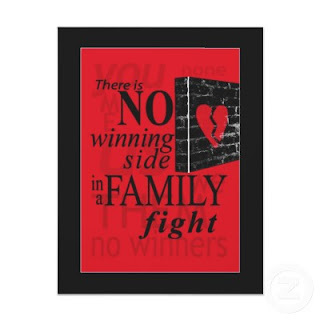 As a family, we should learn how to settle our differences, come what may so that at the end of the day, there will be no bad blood between each members. Always remember that sometimes some small misunderstandings, accumulate and pile up to bigger problems in the future so do your best extinguish the fire while it's small before it gets blown out to massive proportions. Who knows if you can still deal with them by then? This is so true. Don't believe me then how do you feel whenever you fight with someone that you love? Don't you feel bad and guilty about it in the end? The same goes for having a misunderstanding with one of your family members. Why can't we all just get along? I hope I can say that. Oh well, there are things that pushing me away from them but I am trying to reach out. Time heals all wounds. I guess you just need more time to be able to forgive and forget.